Each month I discuss recent science stories with presenter Chris Warburton on the BBC Radio 5 Live programme Saturday Edition. Yesterday I reviewed a few of the stories that had caught my eye over the past year. There is a podcast of the show (broadcast on Saturday Dec 28th, 15 minutes in) in the Let’s Talk about Tech series and I thought I’d also include a summary of the stories here. They’re not just astronomy and space but I have to admit a certain bias! This was a total surprise and a very real reminder of the risk posed from asteroid impacts. Although there are a number of programmes to search for near-Earth objects which might be on a collision course with Earth, this one went undetected because although it’s estimated to have been 17 metres across, it counts as relatively small in cosmic terms – the smaller they are, the harder they are to find. Luckily, there are many more small things orbiting the Sun than there are big things. In fact, about 100 tons of material arrives from space into the Earth’s atmosphere each day but it’s largely in the form of dust. Of course, big things do hit, as the Chelyabinsk meteor showed. The last time one anything like this size hit the Earth was at a place called Tunguska in Siberia in 1908, flattening a large area of forest. On average every 10,000 years or so, we expect a much larger 100-metre scale asteroid to hit Earth and cause local disasters. Global disasters might be caused by something larger than about a kilometre, but these might be expected to hit only every few hundred thousand or more. The Chelyabinsk event was caused by a lump of stony chondrite weighing over 10,000 tons entering the atmosphere at a speed of about 40,000 mph at quite a shallow angle. As it blasted through the atmosphere, much faster than the speed of sound, it drove a shock wave (a sonic boom) and then exploded into bits about 25 km up. The total energy involved was something like 20-30 Hiroshima atom bombs. The sound waves it generated travelled around the Earth and were detected by a network designed to listen out for nuclear explosions. It was the sonic boom that caused damage to buildings in six cities across the region, blowing out windows and injuring about 1,500 people. Most of the amazing footage you can find on sites like You Tube comes from continuous recording using cameras mounted on vehicle dashboards (extremely common in Russia and apparently used for evidence in insurance claims and the like). In November some footage from a CCTV security camera came to light showing the impact of a half-ton fragment of the meteorite into a frozen lake. This incident has become so well known that the gold medals to be given out on the anniversary of the meteor 15th Feb 2014 (the anniversary) at Winter Olympics in Sochi will include fragments of the meteorite! One of the weirder features was that all this happened just hours before asteroid 2012 DA14 was due to pass within 28,000 km of the Earth. In fact, I was on the BBC Breakfast sofa first thing that morning to talk about 2012 DA14 when I was passed an early report of the Chelyabinsk meteor and asked to comment. Of course the first thing that went through everybody’s mind was that they were somehow related. As it turned out, they were on different trajectories so it was just an incredible coincidence. During 2013 there were several major landmarks in space exploration to pick from. 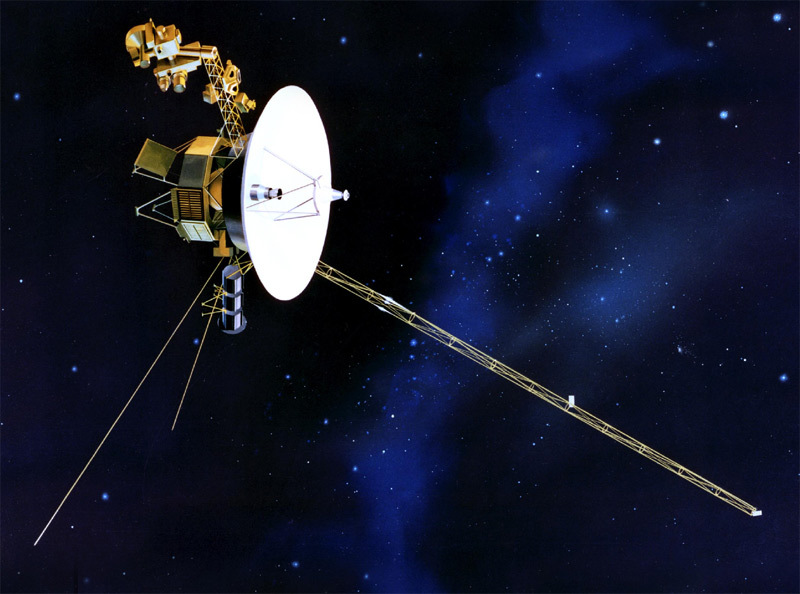 In September, it was announced that NASA’s Voyager 1 spacecraft had become the first human-made object to reach interstellar space. Launched in 1977, it was one of a pair of spacecraft whose missions were to explore the outer planets. Voyager 1 flew past Jupiter and Saturn and is now 19 billion km away. This year it was finally announced that it had entered interstellar space and is now surrounded by the plasma between the stars. There’s been a lot of talk over the past few years over whether it had or hadn’t reached interstellar space and that’s because it turns out to be rather more complicated than expected. Instruments on the spacecraft can measure the impact of particles from the Sun and from outside the solar system. They can also measure the magnetic field strength and direction. The combination of all these data is what suggests whether the spacecraft has moved beyond the heliosphere (the region dominated by the Sun). It was in September this year that scientists agreed that Voyager 1 had passed into interstellar space sometime in August 2012. Now we may be saying that it has entered interstellar space but it hasn’t left the solar system. It’s well beyond the orbit of the outermost planet Neptune, and any of the known dwarf planets. But there will be small bodies orbiting the Sun beyond this distance, not least the huge Oort cloud of comets. Defined in terms of the Sun’s gravitational influence, the solar system could extend to several light years (the nearest other star is 4.2 light years). Voyager 1 is currently about 17.6 light hours away and moving away from the Sun at a speed of almost 40,000 miles per hour. It is powered by the decay of plutonium-238 which is expected to run out in about 2025, until then we will continue to receive scientific data. Voyager 1 is our most distant messenger, carrying with it a golden record containing sounds and images designed to explain the diversity of life on Earth, including spoken greetings in many languages, natural sounds of Earth, and messages from UN General Secretary Waldheim and US President Jimmy Carter. Barring an unlikely collision with another star or being picked up by a passing interstellar spacecraft, it will continue to orbit the galaxy for many millions of years. 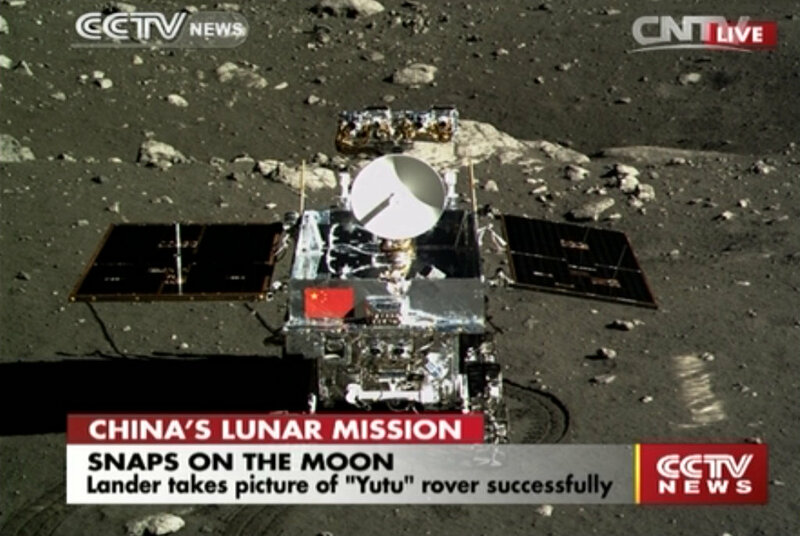 The Yutu rover on 15th Dec 2013 taken by the Chang’e-3 lander. The Chinese Space Agency successfully landed a probe called Chang’e 3 on the Moon on Dec 14th. 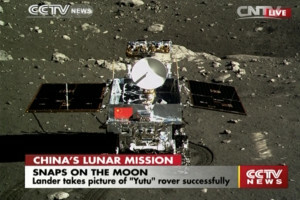 It carried a rover (Yutu) which trundled down a ramp and circled the lander whilst they took photographs of each other. This is the first such soft landing on the Moon for almost 40 years, since the Soviet Luna 24 in 1976. The mission is carrying various scientific instruments which will study the composition of the surface and sub-surface layers and even a small telescope making it the first astronomical observatory on the Moon. After sending back some great photos which really brought back the excitement of the original space race they’ve now gone to sleep for a few weeks in the lunar night. Although there are important scientific returns from this mission it might be most important as a symbol of China’s desire to be a major player in space exploration. They already have a space station and they plan to send a sample return mission to the Moon in 2017 followed by astronauts later in the 2020’s. It seems likely that the next people to walk on the Moon will be Chinese. The Indian Mars Orbiter Mission was launched in November. 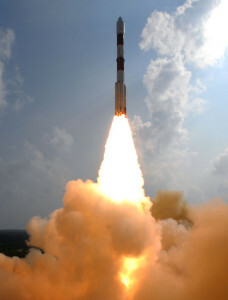 As the name suggests it is designed to go into orbit around Mars (in September 2014) and to carry out a number of scientific experiments including analysis of loss of atmosphere into space, measuring atmospheric methane (which has implications for life on Mars), plus surface imaging and spectroscopy for composition studies. It will arrive around the same time as NASA’s MAVEN and the two teams expect to carry out complementary studies. The Mars Orbiter seems to have cost about 70 million dollars, actually very cheap for a space mission. It has drawn some criticism however from people arguing that India has far greater problems to solve and should concentrate its resources at home. But aid agencies responded more positively, saying that it’s important for a country like India to have an economy that both develops high-tech industry and addresses issues like poverty, education and healthcare. Let’s hope both the Indian and Chinese missions continue to be successful – the future of space exploration looks very exciting! 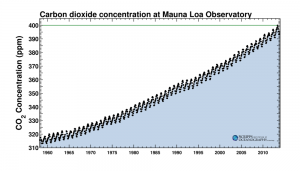 In May this year, instruments in Hawaii showed that carbon dioxide levels in the atmosphere reached 400 parts per million for the first time in at least 800,000 years (we have ice core data going back that far that shows nothing as high as this). In pre-industrial times the level was around 280 ppm and in the 1950’s when this particular experiment was set up they were only 315 ppm. 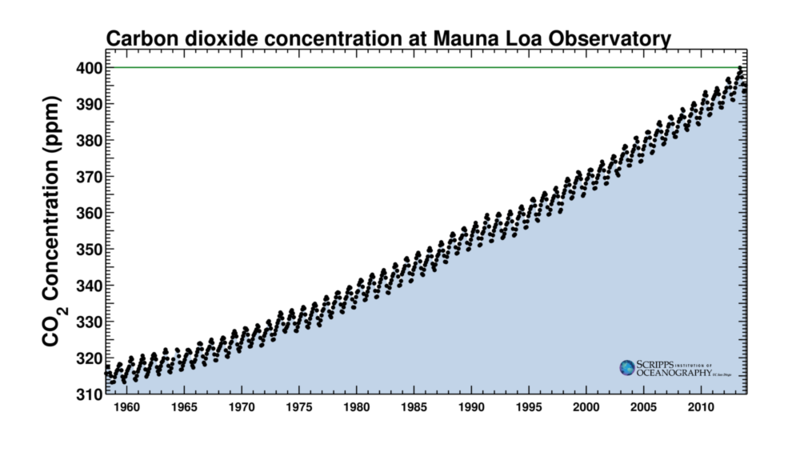 The data showing the inexorable rise since the 1950s (known as the Keeling Curve after the scientists that set up the study) is particularly notable. Of course the problem is that carbon dioxide is a greenhouse gas, absorbing infrared radiated from the ground and so acting like a blanket, trapping solar energy, warming the Earth and leading to climate change. The IPCC (Intergovernmental Panel on Climate Change) working group on the physical science basis of climate change comprising a thousand scientists reported in September that “it is extremely likely that human influence has been the dominant cause of the observed warming since the mid-20th century”. This human influence is not abating. In 2012 we pumped 36 billion tons of greenhouse gases into the atmosphere, up from 35 just the year before. The consequences are already apparent. Sea ice is disappearing at a huge rate, global temperatures have increased by 0.8 degrees. Models suggest that a carbon dioxide level of 450 ppm would be linked to a temperature rise of 2 degrees, leading to extreme weather events, significant sea level rises and warming oceans, with impacts on wildlife as well as humans. Perhaps the most terrible example of extreme weather in 2013 was Typhoon Haiyan. Of course, it’s important to say that it is difficult to directly link individual instances of weather to climate change. However, climate scientists agree that the increasing concentrations of greenhouse gases is putting more energy into the climate system and the oceans in particular and this is likely to result in more intense extreme weather. Haiyan was an extremely powerful cyclone that made landfall in the Philippines on November 7th with winds of around 200mph, making it the most powerful ever to do so. It swept across the Philippines before heading across into Vietnam as it gradually weakened. According to a United Nations report a month later, Haiyan was responsible for 6,000 deaths with a further 1,800 people missing, for displacing 4 million people and destroying or damaging over a million homes. A major aid programme means things are improving but the devastation was so widespread and massive that it will take years to recover. In January it was announced that researchers in South Africa had discovered that dung beetles can navigate using the Milky Way. They see the stripe of light running across the sky coming from billions of stars in our galaxy, and move in a line relative to it. During the day they can detect the Sun and at night the Moon, but it turned out that even on moonless nights they could travel in straight lines using the Milky Way. 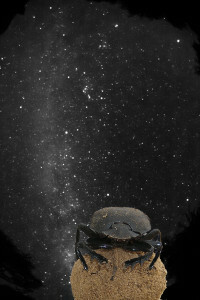 The researchers tested this idea by bringing the beetles (and presumably the dung) into a Johannesburg planetarium and even made the beetles wear little cardboard hats to block their view of the sky (with some control beetles wearing transparent hats). In the wild, the beetles make a bee(tle)-line for the nearest fresh pile of dung, grab some of it and roll it into a ball. They quickly roll the ball in a straight line away from the dung pile. It’s important for the beetles to keep on track because other beetles swarming around the pile will steal the ball if they stray back towards it. The ball is then buried. After mating, the female deposits eggs inside the buried ball where it serves as a brooding chamber and food source for the larvae. In September the researchers received an Ig Nobel prize for their Milky Way discovery. These awards are highly prized, given for genuine scientific research that “first makes people laugh and then makes them think”. Other winners this year included research showing that mice survived heart transplants much better if they were made to listen to opera (apparently Mozart or Enya didn’t show the same effect); proving drunk people think they’re more attractive; and for archaeological research in which the scientists swallowed whole dead shrews and then examined their own excreta. 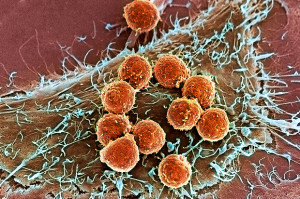 Scanning electron microscope image of T cells (orange) attached to a tumour cell. Last week this was named scientific breakthrough of the year by editors of Science Magazine. They argue that there has been a turning point in cancer treatment, specifically in using the body’s own immune system against tumours. The biology underlying this approach has been investigated and developed for many years but some crucial results have started to come in the last few years. Now several studies have shown that antibody treatment can extend the life of some patients with advanced melanomas and other cancers. Another approach involving genetic modification of the body’s own T cells so that they target tumour cells has also reported positive results on patients with leukaemia. Back on the space theme, in January the European Space Agency is going to wake up a spacecraft and prepare it to land on the surface of a comet. The Rosetta spacecraft was launched by the European Space Agency in 2004 and since then has looped around the Earth three times and Mars once, gaining energy each time. It has flown by and photographed two asteroids before in June 2011 it was put into deep space hibernation to conserve power for the coldest, most distant leg of the journey as it travelled some 800 million kilometres from the Sun, close to the orbit of Jupiter. You don’t need a lullaby or a swinging watch to put a spacecraft to sleep. A radio signal was sent, instructing it to shut down almost all the electrical systems other than the radio receivers, decoders and power supply. Now, as both the comet (Churyumov-Gerasimenko) and the spacecraft are on the return journey back into the inner Solar System, the Rosetta team is preparing for the spacecraft to wake up. The command to switch it back on again will be sent on January 20th at 10am. It will then rendezvous with the comet in August and the lander Philae will land on its surface in November. 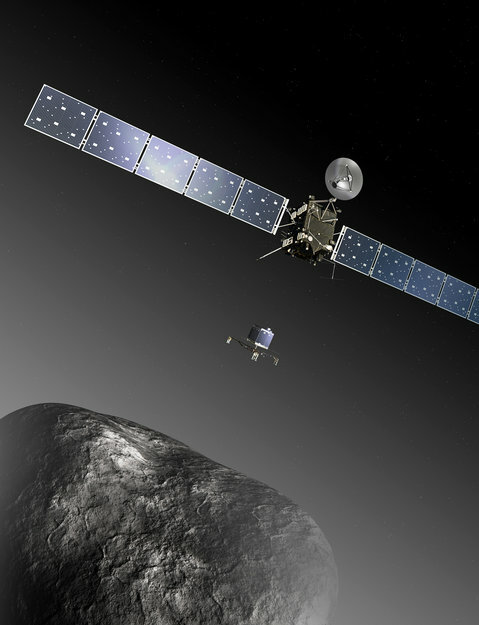 This will be the first spacecraft to orbit and land on a comet. The spacecraft will fly with the comet for two years as it passes by the Sun and warms up. The lander will drill into its surface and study its composition. Comets are remnants of the early solar system and their study helps us to understand how our planetary system evolved. For example, Rosetta’s study of the abundances of various isotopes should help us investigate whether Earth’s water was brought to us by comets. If you fancy getting involved, the European Space Agency are running a competition via their Facebook page for people to upload a video clip of you shouting “Wake up, Rosetta!”. The best ten will get transmitted out towards Rosetta and beyond, and the top two will get to visit ESA when Phylae lands on the comet in November. This year we found out that the universe is 100 million years older than we initially thought. We know the Universe is expanding and so if you track it back in time its beginning was in the Big Bang about 13.8 billion years old. Results published in March provided the best ever data on the Big Bang showing, amongst other things that the Universe is 100 million years older than we previously thought and confirming that only 5% of the Universe is made of stuff we understand, the remainder is mysterious dark matter and dark energy. These data were provided by the European Space Agency’s Planck spacecraft (low noise amplifiers on the spacecraft were built by the engineers at Jodrell Bank). 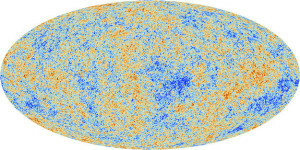 Planck detects cosmic microwave background radiation from only 380,000 years after the Big Bang. This is the oldest light we’ll ever see, stretched by the expansion of the Universe so it is now in the microwave radio part of the spectrum. Encoded within the patterns we see in its brightness variations is evidence of the very first structures in the Universe, structures that went on to form the stars, galaxies and even ourselves. Planck has now finished its work and been switched off, but its data are still being analysed and some of the most interesting results could still be to come. By looking at the polarisation of the microwave emission, we may be able to see the signature of gravitational waves rippling through the Universe in the first fraction a second after the Big Bang. This would help test our current models of the origin of the Universe including an important but as yet unproven element of the theory called inflation. We will have to wait and see until later this year whether Planck has managed to see this effect known as B-mode polarisation. Meanwhile, an instrument taking advantage of the clear, dry skies at the South Pole (appropriately enough called the South Pole Telescope) provided the first B-mode detection in July. Discoveries using another telescope at the South Pole suggest a whole new way of doing astronomy might be just around the corner, using particles to study the Universe and not just light. In November, the IceCube observatory announced the detection of 28 neutrinos (ghostly particles which are extremely hard to detect) which appear to have come from outside our solar system. Two kilometres below the Antarctic surface, IceCube uses a cubic km of ice to look for faint flashes of light when neutrinos interact with the atoms in the ice. Astronomers are stuck on Earth (or in space quite close to the Earth) unable to travel much closer to the objects we study. We use telescopes to collect all the data we can, largely in the form of electromagnetic radiation from gamma rays to radio waves. But these new results, awarded Breakthrough of the Year by Physics World Magazine, could mark a significant step forward into a new era of collecting particles from the distant Universe.